A shooting in Sheffield over the weekend came one month after three men were fired at in the same Sheffield suburb. South Yorkshire Police said a man in his 20s was shot in his leg in Verdon Street, Burngreave, at 11.30am yesterday. He was taken to hospital for treatment and is in a stable condition today. Three men were arrested in connection with the incident and remain in police custody this afternoon. Last month – on Sunday, September 16 – three men, two aged 20 and one, 19 – were shot in Hallcar Street, just off Spital Hill, Burngreave, in another gun attack. No charges have yet been brought over that shooting. There have been a number of shootings in Burngreave over recent years. One of the most high profile cases was the murder of 16-year-old Jonathan Matondo, who was gunned down close to a children’s playground in a postcode gang war which spiralled out of control in 2007. The teenager, from Verdon Street, was shot in his head at the Nottingham Cliff recreation ground, with detectives believing he was targeted by a rival gang. One man stood trial twice over the shooting but was found not guilty and nobody else has faced any charges. Tarek Chaiboub, 17, of Wincobank, was shot dead in Burngreave when the S3 gang he was a member of imploded. He was fired at near Frenchie’s barbers in Spital Street in what was described at the time as like a scene from a ‘wild west’ shoot-out. His killers were jailed for a total of 110 years after being found guilty of murder. In 2012, gunman Abdi Omar was jailed for at least 30 years for firing a sawn-off shotgun over his shoulder into a crowd of revellers during a birthday party at the Spital Hill Plaza in Burngreave – killing 18-year-old Deeq Ali. Another fatal shooting which shocked the suburb resulted in the death of dad-of-seven Gerald Smith, who was killed in December 2002 outside the Afro Caribbean Club on Spital Hill, Burngreave. 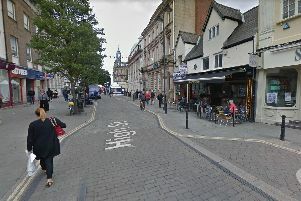 He was said to have been in the wrong place at the wrong time and had no connection to the nine Nottingham men involved in the attack. They opened fire after travelling to Sheffield on a revenge mission after one of their gang members was robbed in a city takeaway. Anyone with information about the latest shooting should call South Yorkshire Police on 101 or Crimestoppers, anonymously, on 0800 555111.